Ultraviolet sterilization is a very effective way to disinfect a water supply. UV sterilizers actually mimic nature's own method of water disinfection. Exposure to the UV light causes disruption to bacterial and viral DNA. This eliminates the microbes' ability to reproduce, which renders them harmless to humans. Ultraviolet sterilization is effective in treating for bacteria, viruses and parasites. Historically, chlorination has been the most common method of disinfection, but as UV technology has improved, the use of UV sterilization has gained popularity. When chlorine reacts with organic matter in the water, it produces disinfection byproducts, most of which are either known or suspected to be carcinogenic. Health risks associated with these byproducts have changed our water quality standards, as the EPA now regulates maximum contaminant levels for THM's (trihalomethanes). Ultraviolet disinfection is typically used with private water supplies from streams, lakes, or wells which are known to be bacteriologically unsafe, or in commercial applications requiring additional bacteriological protection. UV sterilization offers many advantages, including no change in water taste, no harsh chemicals, and no production of dangerous disinfection byproducts. It is rapid, effective, and relatively easy to install, monitor, and maintain. Ultraviolet disinfection is never used as the sole method of water treatment. At the very least, it should be accompanied by sediment prefiltration to ensure that bacteria and viruses are not shielded from the UV light by particulates in the water. Additional pretreatment is necessary for hard water and water with significant levels of iron, manganese, sulfur, or turbidity. Custom Pure carries UV sterilizers made by Trojan Technologies. We keep in stock models rated at 8 gpm and 2 gpm, and can special order models with other flow rates up to 12 gpm. 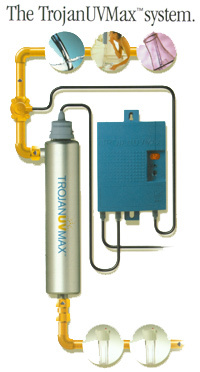 The 2 gpm model is used in conjunction with a point-of-use filter serving water at primarily one tap. The 8 gpm and larger models are typically used as part of a whole house water treatment system or part of a commercial application. If you would like to know more about our UV sterilizers, please contact us . We'll be happy to help you determine the proper equipment size and pretreatment requirements for your system.